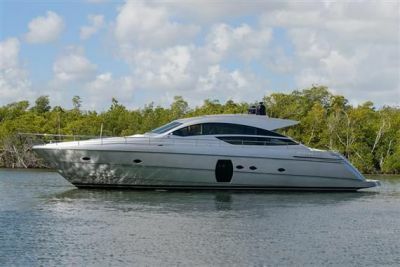 2019 Sunseeker 74 Sport Yacht | Available for Immediate Delivery | Located in Miami. 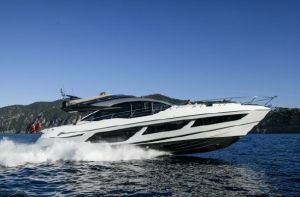 A fantastic opportunity to own one of Sunseekers most popular new models. 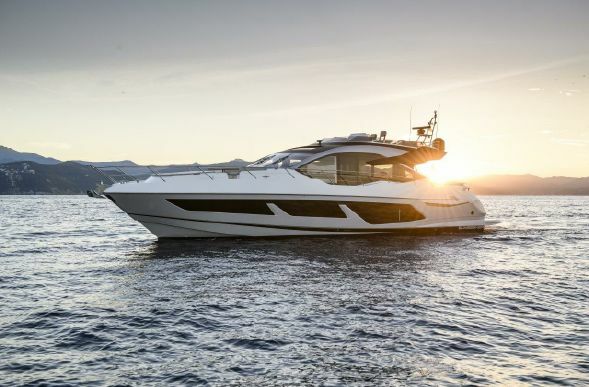 The 74 Sport Yacht has everything. 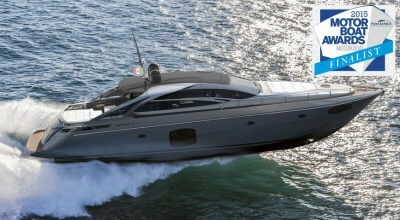 Speed (38 knots), handling, and a sleek modern design. Powered by MAN 1900 engines coupled with twin fixed-pitch submerged props in semi-recessed tunnels. 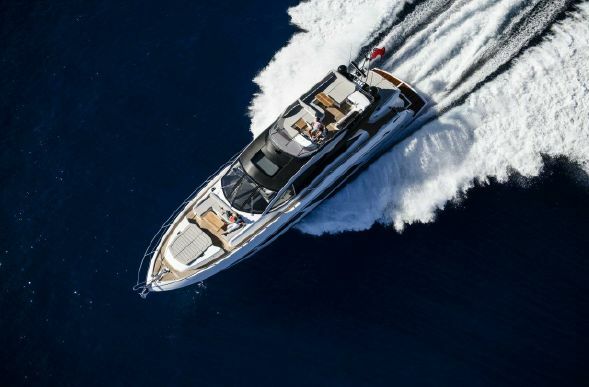 The performance of surface drives with the practicality and fuel efficiency of a traditional shaft and prop configuration. The best of both worlds. 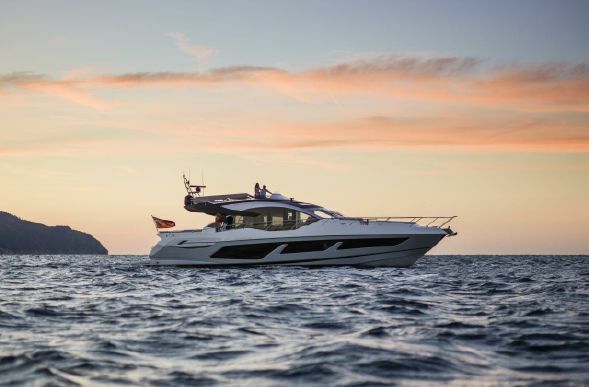 On the lower accommodation level, this 74 Sport Yacht offers three spacious guest cabins comprised of a full beam master stateroom, a forward VIP, and a starboard twin guest cabin, each with their own private bathroom. 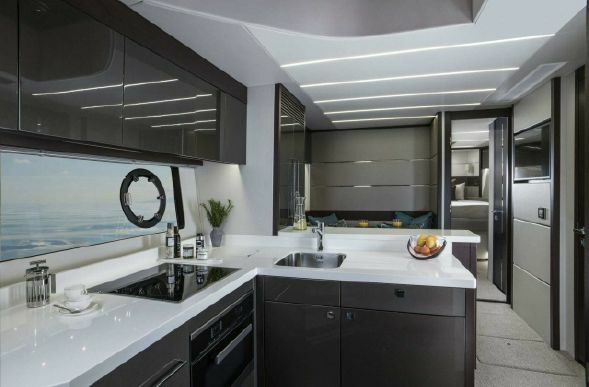 Also on the lower level is an open galley configuration with a co-joined dinette. The main deck level is phenomenal. 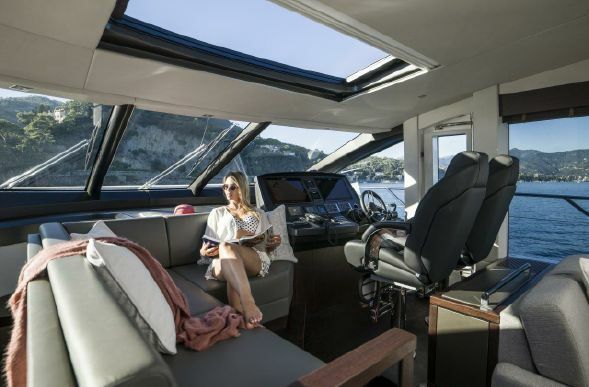 The aft cockpit seating merges with the aft saloon via a drop down window to create an indoor / outdoor space that will rival any 80′ yacht. 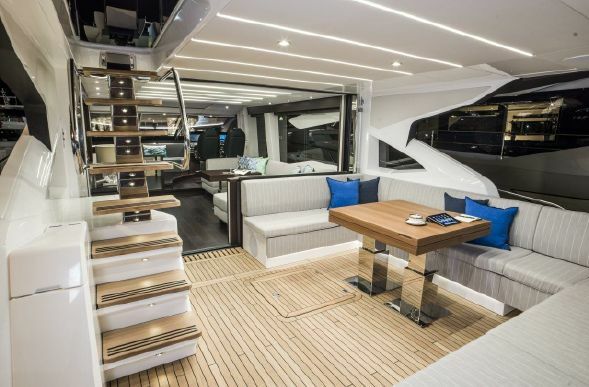 The exterior elements of the 74 Sport Yacht provide ample seating and lounging to accommodate even the largest of get togethers. With three distinct exterior spaces, you will never run out of options when entertaining. 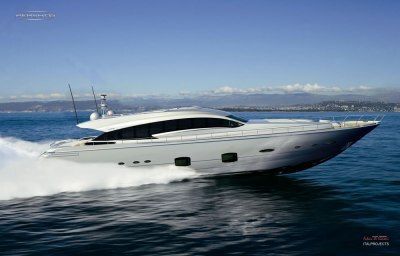 Contact us at 514-521-1221 (in french also) for all details about this Sunseeker 74 Sport Yacht. This beauty is only enhanced by cutting-edge technology and elegant finishes throughout. 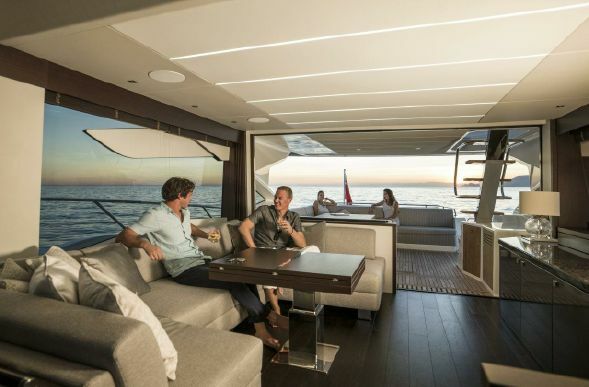 It’s everything you and your many guests could wish for.Space and socialising are key to this impressive new Sport Yacht. 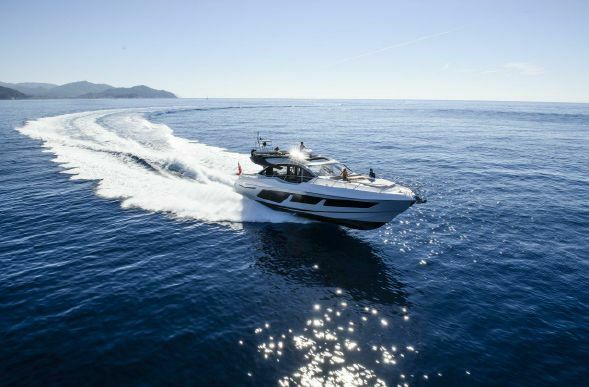 Built with copious amounts of entertaining space, including plenty of comfortable seating, large sunpads both fore and aft. 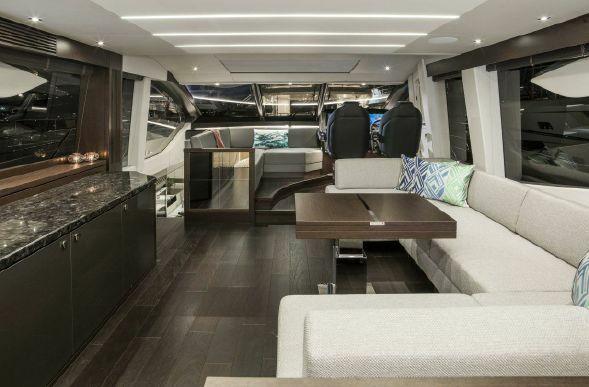 The cockpit space is seductively shaded by the bridge deck and hydraulically drop-away cockpit doors allow the interior living space to become one with the outside. Simrad NSS12 evo3 12″ Chart plotter multifunctional displays x 2. 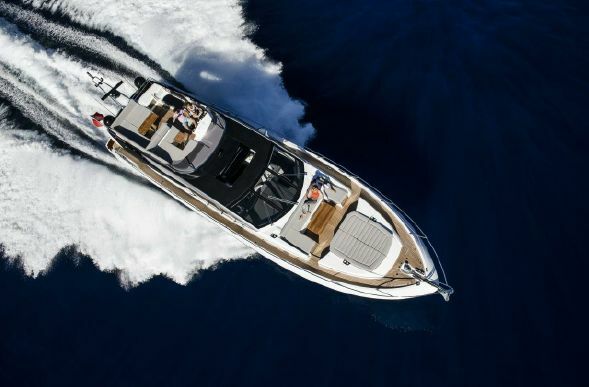 Simrad IS42 Multifunction Instrument – displaying speed and depth. Simrad IS42 Speed/Depth Instruments x2 with Sonar hub sounder module with B744V depth/speed/temperature transducer. 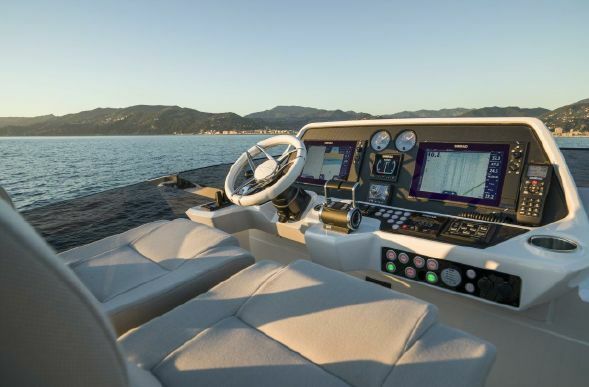 Simrad Two 19″ MO19-T Multifunctional touch displays. Simrad NSO processor. 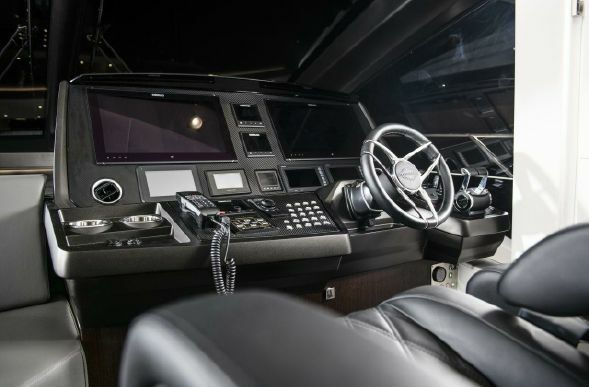 Simrad OP50 Navigation Controller and Simrad GS25 GPS. Simrad Go-Free wireless bridge to control the NSO from your iPad or iPhone. Aft docking station. Third Rexroth Aventics – Marex OS 3D Joy stick. Camera monitoring and docking system – Platform view infrared dome camera and two engine view infrared room cameras. Linked with multi switch to Navigation displays. CCTV panel on console. CCM362 rear speakers and Sonos connect Amp. Apple TV. 2. 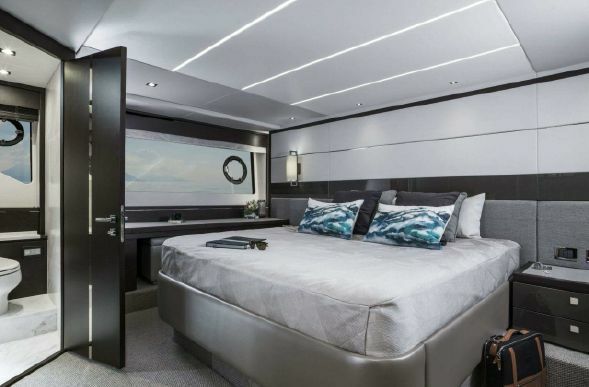 Master stateroom Samsung 40″ television with a Samsung Blu-ray player and Sonos Playbar and Sonos Subwoofer. Apple TV. 3. Forward cabin Samsung 40″ television with a Samsung Blu-ray player and Sonos Playbar. Apple TV. 5. Port Guest cabin option Samsung 22″ Television with a Samsung Blu-ray player and Sonos Connect Amp with ceiling speakers. Apple TV OR Lower saloon option is Samsung 32″ Samsung Blu-ray player and Sonos Playbar. Apple TV. and Sonos Connect and amplifier. All with Apple Airport Express for wifi streaming. a router with one tablet supplied for control of the zones through a Sonos App. Teapot, 1x Cream/milk jug, 1x Sugar bowl, 1x Salt pot and 1x Pepper pot. Sleipner SPS66B hull stabiliser unit with Vector Fin VF1050-1.05 metre. Upgraded Black Water tank 435 litres. Discharge via a either deck mounted fitting or to sea. Mooring cleats 14″ in polished stainless steel fitted port and starboard on the fore deck and aft main deck. Spring cleats 12″ x two sets in polished stainless steel fitted port and starboard on bulwark. Aft sportbridge seating group sunbed with two fold up back rests.